Who invented Ketchup? The name of the person credited with inventing Ketchup is James Mease (1771 - 1846). James Mease is not only famous as the American inventor of Ketchup but also as a scientist and horticulturalist. When was Ketchup invented? James Mease invented Ketchup in 1812, during the First US Industrial Revolution (1700 - 1860) period of invention. Discover how the tomato became the main ingredient of ketchup and why the tomato was referred to as the "poison apple" and then the "love apple". Definition of Ketchup: Ketchup is defined as a thick, smooth-textured, spicy tale sauce (condiment) designed to enhance the flavor or enjoyment of food. The main ingredients of ketchup are tomatoes, vinegar, salt, spices, flavorings, onion and garlic. Tomato plants are classified as a type of deadly nightshade, a poisonous family of the highly toxin Solanaceae plants. Fact 1: Who invented Ketchup? Ketchup was invented by James Mease in 1812 during the First US Industrial Revolution era of inventions (1700 - 1860). Fact 2: Who invented Ketchup? The word 'Ketchup' derives from the Chinese word 'ke-chiap' meaning "brine of fish" that consisted of pickled fish and spices. Fact 3: Who invented Ketchup? The Chinese 'ke-chiap' was brought to England by early European sailors, explorers and merchants during the first half of the 14th century of the Middle Ages who were involved in the lucrative Spice Trade. Fact 4: Who invented Ketchup? Pickling in a salt brine was the standard method of preserving fish during the Middle Ages and spices were added to disguise the salty taste. The Chinese recipe for 'ke-chiap' was used by cooks preparing food supplies for the long voyage back to Europe. Fact 5: Who invented Ketchup? The word 'koechiap' was Anglicized as 'Catsup' then as 'Catchup' and finally as 'Ketchup' by the early seamen and was used in soups and stews to add flavor. Fact 6: Who invented Ketchup? The first written record of the word 'Ketchup' appeared in 1690 that detailed a vocabulary of slang, called 'Dictionary of the Canting Crew', that was used by vulgar, unsavoury lower classes such as thieves, beggars and cheats. Fact 7: Who invented Ketchup? Ketchup was originally a fish sauce but the word came to be used in English for a wide variety of spiced gravies and sauces that were used with both fish and meat with mushrooms as a primary ingredient but at this point in time tomatoes were not used. Fact 8: Who invented Ketchup? Tomatoes originated from the Andes, in Peru, Bolivia, Chile and Ecuador and were introduced to the early Spanish explorers of the New World by the Incas. The Spanish conquistadors took the seeds across the Atlantic to the Southern Europeans and the quick growing tomatoes flourished in Meditteranean gardens and kitchens. In Northern Europe it was a completely different story. Fact 9: Who invented Ketchup? When Tomatoes were first introduced to England wealthy people become sick and died after eating them and they were given the nickname "poison apple". Tomatoes were served to the upper classes on pewter plates, which were high in lead content. Tomatoes, being high in acid, would cause the lead to leach into the food, resulting in lead poisoning and death. Fact 10: Who invented Ketchup? Most people in England and other Northern European countries avoided eating tomatoes, the "poison apples", for nearly two hundred years. However poor people, who ate from wooden plates, never suffered any ill effects from eating tomatoes. Fact 11: Who invented Ketchup? Early European immigrants to the American colonies, many from poor backgrounds, were aware that tomatoes were edible. The Spanish colonists in 'New Spain' who had settled in the southeastern states of New Mexico, Arizona, Florida, South Carolina and across the Mississippi River all enjoyed tomatoes and the scepticism surrounding the tomato slowly disappeared from the French, British and Dutch colonies of the New World. Fact 12: Who invented Ketchup? It is therefore not surprising that the Tomato Ketchup, that we know and love today, was invented by an American. Fact 13: Who invented Ketchup? The inventor of Ketchup, James Mease, was born on August 11, 1771 in Philadelphia, Pennsylvania, United States and died on May 14, 1846. Fact 14: Who invented Ketchup? The early years of James Mease were spent in Philadelphia, Pennsylvania, United States where he was raised by his family, his parents were John and Esther (Miller) Mease. James Mease was educated at University of Pennsylvania and went on to medical school and became a successful physician and author. Fact 15: Who invented Ketchup? James Mease was well travelled and demonstrated an interest in history in particular the lives of the "common man" which he meticulously noted in his journal. James Mease became a prominent citizen in Philadelphia and his many interests included natural history and agriculture several agricultural and horticultural societies. Fact 16: Who invented Ketchup? James Mease married Sarah Butler, the daughter of South Carolina Senator, Pierce Butler on July 3, 1800 and the couple went on to have two sons. Fact 17: Who invented Ketchup? James Mease edited the Domestic Encyclopedia (1803 - 1804) and wrote that the choicest sauces came from "love apples" and that they made a fine 'catsup'. Tomatoes had acquired the nickname "love apples" because, by this time many people believed they were an aphrodisiac. Fact 18: Who invented Ketchup? James Mease published the first known tomato ketchup recipe in 1812. The recipe consisted of unstrained tomato pulp, spices and brandy but lacked vinegar and sugar. None of the previous recipes for ketchup included tomatoes. Later manufacturers added vinegar and sugar to the recipe which helped to preserve the tomato pulp. Fact 19: Who invented Ketchup? James Mease suspended all of his publications when the 'Second American Revolution' broke out. He left Philadelphia and served as a surgeon for nine months during the War of 1812 (June 18, 1812 - December 24, 1814) between the United States of America and Great Britain. Fact 20: Who invented Ketchup? James Mease survived the war and returned to Pennsylvania where he spent the rest of his life. He died at his home in Philadelphia on May 14, 1846 and was buried in the cemetery of Third Presbyterian Church. Fact 21: Who invented Ketchup? Recipes for tomato ketchup began to appear in recipe books in America, but it was still commonly referred to as 'catsup'. The word ketchup was not in common use until the 1870's. Fact 22: Who invented Ketchup? Jonas Yerkes of New Jersey is credited with being the first American to bottle ketchup in 1837. Early manufacturers of the condiment were the Williams Brothers of Detroit and Horace Thurber in New Jersey. Fact 23: Who invented Ketchup? F. & J. Heinz launched their tomato ketchup in 1876 and by this time manufacturers began to differentiate catsup and ketchup based on quality. Heinz marketed their top quality sauce as 'Keystone Ketchup' and the bottom of the range as 'Duquesne Catsup'. Fact 24: Who invented Ketchup? Henry Heinz, like other manufacturers, was adding mauveine, commonly known as coal-tar, the first synthetic organic chemical dye to enhance the red coloring his sauce and and sodium benzoate and benzoic acid was added as a preservative. Henry Heinz became determined to make his products as pure as possible and in 1904 his chief food scientist, G.F. Mason, was able to find a good, preservative-free recipe for ketchup complying with the Pure Food and Drug Act (PFDA) of 1906. Fact 25: Who invented Ketchup? Heinz tomato ketchup dominated the market and by 1907, Heinz were producing 13 million bottles every year. In modern times the number has increased to 650 million bottles every year. Fact 26: Who invented Ketchup? Tomato ketchup is the most popular type of condiment ever made, a great accompaniment to fast foods such as Hamburgers and French Fries. 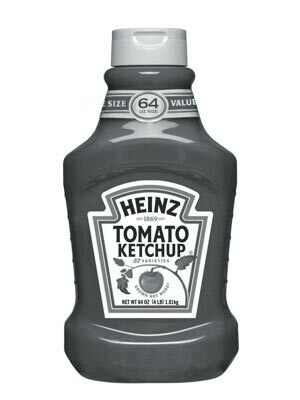 Tomato ketchup can also be found in 97% of American homes.